Joyce Graham Fogwill, the author of the Bubs the Bumblebee children's books, is a College Botany and Biology Instructor with graduate degrees in Science and Education. These books, with their amazing colour photographs and imaginative stories, introduce children to the wonders of nature, focusing on the lives and interactions of bumblebees, other insects and spiders in the garden. They are educational, informational and entertaining, encouraging children to read, observe and ask questions about the natural world. Books recommended for children ages 6-10. Insects are good for our environment and learning about them can be fun and interesting for all ages. In Joyce Graham Fogwill's Bubs the Bumblebee and the Spider's Web one can learn about bees and spiders' habits and lives. 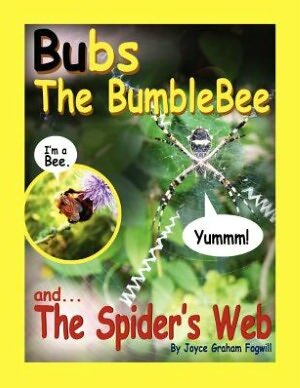 www.filedby.com/author/joycegrahamfogwill-This book introduces children to Bubs the Bumblebee and to some insect trapping-Carnivorous Plants.